The true story of a simple man who has spent his life working amidst the quiet embrace of nature and her animals. Despite the happy normalcy, his soul calls out to him through a series of visions urging him to search for the higher design in his life. His inner voice beckons him out into the wilderness, away from all that he knows and understands, to find the higher meaning of himself. 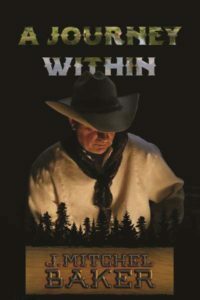 After nearly a decade of stubborn denial, he removes his self-imposed blindfolds to embark on what is to become his personal journey into the unknown.What he finds will forever change his life. Instead of meaning, he finds a tempest. Finding courage through his animals he forges onward in search of his own truth. Is there a greater universal design for each of us? Or is there only chaos and confusion? Your answer lies within, if only you dare to take the journey. A Journey Within highlights the duality between both the physical and the spiritual. It carries a message of courage and inspiration to connect with life and the inner-self, taking the road less traveled, and living authentically. Mitchel Baker is a graduate of Texas A&M University, living in San Antonio with his family. 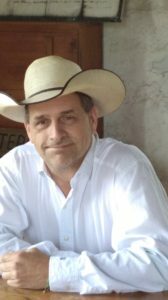 He has dedicated his life to ranching and managing natural resources, and continues to be a student of all things visceral. He is currently working on his sequel to A Journey Within as he stumbles awkwardly toward a higher consciousness. Mitchel Baker has chosen the life of a farmer. To work with his hands to bring crops from the ground and animals into this world. He has a connection to the world with this line of work. He has had wonderful moments and heart breaking ones. But this just makes him a better man. He has had visions and touched animals. This has led him to the adventure that he is on. He has felt a pull drawing him into the wilderness. He teams up with his friend Glynn and they pick a route to go on a long ride. This story is about what he learned on that trip and beyond. I really enjoyed this book. From the spiritual connection to the land and the animals, I was drawn in from the start. I loved with little stories from the good to the bad. There is so much more to this world than just what we see. I loved the connection Baker had to the animals. I grew up on a small farm so I can relate to what he is talking about. I loved the idea of going on the 113 mile ride. But even better was the challenges they both faced and how it help shape them. The journey has some serious challenges but they both come away as better men. Although they had several physical challenges the truly wonderful part of this story was how these affect both men spiritually. For a first book I am in love. I can’t wait to read the next book Baker comes up with. I hope it is further adventures. 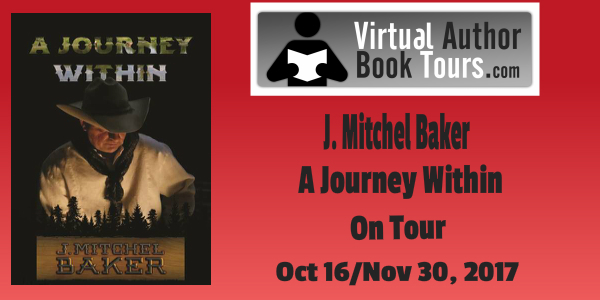 I received A Journey Within from Teddy at Virtual Author Book Tours for free. This has in no way influenced my opinion of this book. I’m so glad you enjoyed ‘A Journey Within’! This is a very touching story. Thank you for the opportunity to review it.